For a while now I’ve been having an issue where when I plug my headphones into the headphone jack of my Logitech 5.1 PC speakers, some YouTube and Facebook videos wouldn’t have sound, but most would. 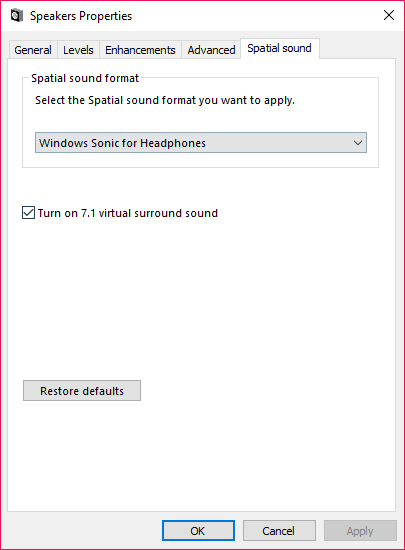 I went poking around in my sound settings (Windows 10) and made the following adjustment: Sound – Playback Devices – Speakers (Realtek High Definition Audio) – Properties – Spatial Sound and set Spatial sound format to Windows Sonic for Headphones and made sure Turn on 7.1 virtual surround sound checkbox was checked. This fixed the issue! If you have Chrome open, restart it and any other existing audio apps for the changes to take affect.